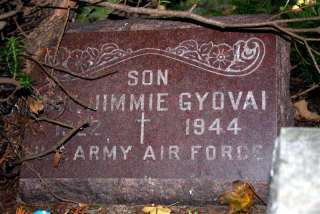 Jimmie Gyovai was born to his Hungarian parents Steve and Ethel Papai Gyovai on the 18th December 1922. 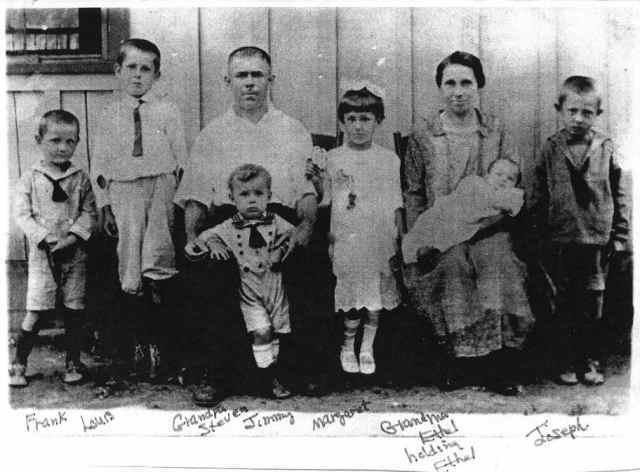 He grew up along with his seven siblings in Red Dragon, an old mining town in the Sherman district of Boone county, West Virginia. After leaving Whitesville High School he went to work with his father and brothers, Louis, Joseph and Frank at Red Dragon mine. 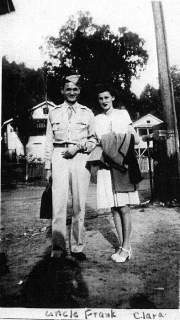 On the 25th October 1942 he left the mine and enlisted in the Army Air Corps at Fort Thomas, Newport, Kentucky. After completing his training as an engineer/air gunner he sailed to the UK to complete his training at the Combat Crew Replacement Centre, Toome. Seven days later his parents received a telegram informing them that he had been listed as missing. It was not until May that they were to learn of his death. In 1947 the cemetery was decommissioned. 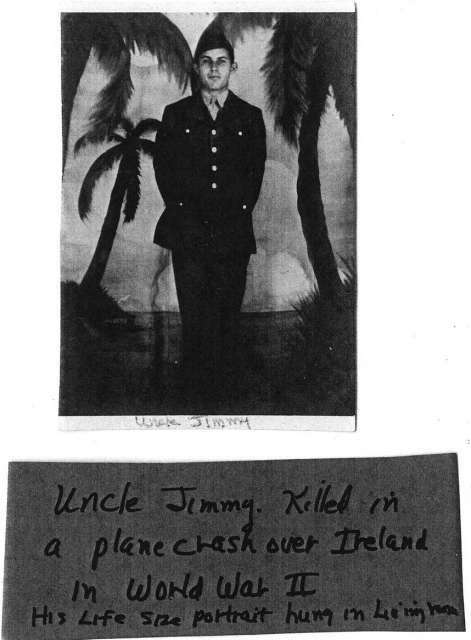 Jimmie's remains were exhumed on the 11th November 1947 and upon the request of his father he was repatriated to the Unitied States on board the US Army Transport ship Lawrence Victory. His grave was maintained by his younger brother Ernest until his death in 1986. His name is recorded on the West Virginia Veterans Memorial in Charleston. The Beckley Post-Herald reported that Oil portraits of two men killed in the line of duty with the armed forces were presented to the parents of the men on the 27th July 1945. One of these portraits was of Sgt Jimmie Gyovai. 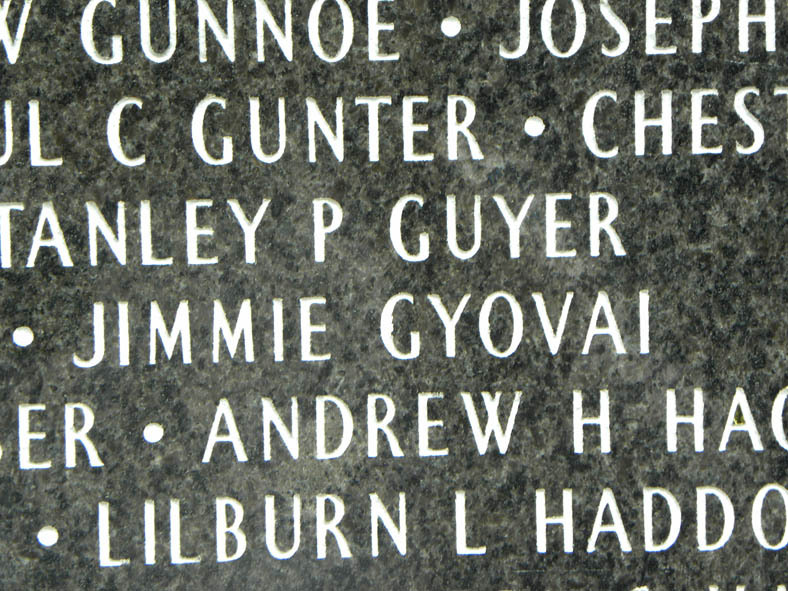 One of Jimmie�s brothers Frank G Gyovai served in the Philippine�s during World War 2 (ttp://www.proviso.k12.il.us/bataan%20Web/Gyoval.htm). He was captured in 1942 when the Filipino and American forces on Bataan surrendered to the Japanese. He started the infamous death march to San Fernando but escaped into the mountains of Bataan and formed a Guerrilla unit, Force 155, with Lt H. Clay Conner. For three years Frank fought the Japanese, saved downed pilots and provided information on Japanese strength receiving a battlefield commission to the rank of Captain as a result. He remained in the Army until 1947 and died on the 21st December 1984. Gyovai family photograph supplied by Jimmie's Great Nephew John Gyovai. Photograph kindly supplied by Jimmie's Great Nephew John Gyovai. Photograph supplied by Selina Brown Illinois. Photograph supplied by John Gyovai.